I was interviewed yesterday by the wonderful Lissette E. Manning. With that she created a wonderful mini cover for it which is the picture you see here. To say I love it is an understatement. Her talent shines through. The fact she is letting me use this cover well I can’t say thank you enough for it. Hi, Sharon. Welcome to my blog. It’s a pleasure to have you here with us. I started seriously writing in the Fall of 2009. I had a story in my head that would not let me rest. My husband had told a friend of mine that he felt I wrote well. Upon her telling me this, I thought, ‘hmm why not’. Having two surgeries at the end of 2009, non-relative, gave me a lot of free time to put to paper the story. I’ve had the honor of previewing the book you’re working on and must say that I’ve enjoyed it immensely. It’s quite a delightful read. Would you mind telling my readers a little more about your book, Jasper, Amazon Parrot: A Rainforest Adventure? This is a children’s book. It is based on my Amazon parrot, Jasper, who adopted us in 1999 at the age of 5. It is based in the rainforest. It is about Jasper, a young parrot, who has many adventures with his friend, Charlie, as they explore their home in the jungle. I got the idea from my bird, Jasper. He has been part of our family since 1999 and our lives have never been the same since. He makes us laugh, cry, angry, but most of all, he makes us love him. His daily antics are what got me in the direction of writing a children’s book based on him. What type of research, if any, did you do for the novel? Most of my research was paying close attention to Jasper. There is hardly a day that goes by where he does not teach us something. A lot of the mannerisms in the books are ones learned from this bird. I also went through my bird books and numerous websites to make sure my facts were accurate where they needed to be. It is a children’s book and I wanted any child who reads this book to learn and get something out of it. Is this the only genre that you’ve written of? Or have you experimented with others? My range is way out there. I write about anything that crosses my mind or path. The stories and books I have written have included children’s books, true life stories, drama, and mysteries. I also have some collections that have a comical tone to it. My first creative writing instructor told me that we should write on what we know. That is what I do. By doing that, my genres are not limited to just one or two. Once the manuscript is ready to be sent out for publishing, will there be any upcoming projects that you’ll be working on and are at liberty to tell us about? 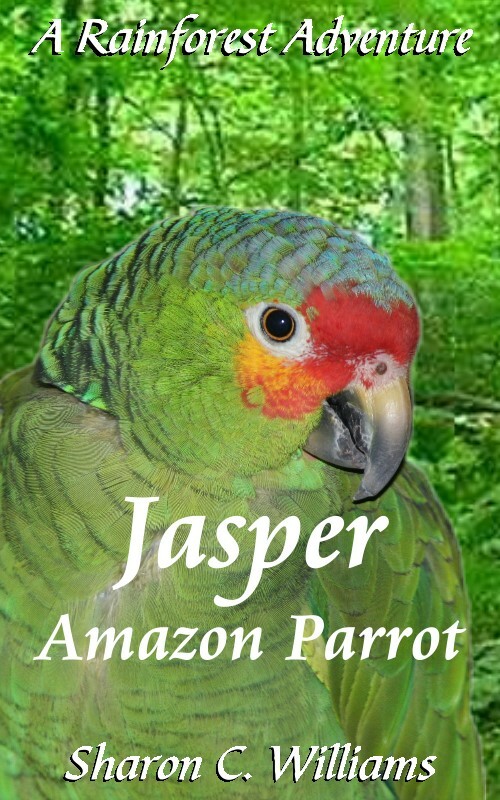 Jasper, Amazon parrot: A Rainforest Adventure is my first children’s book and I am planning to make this a series. I’m 2/3rds done the next installment. I also have written “Squirrel Mafia” which is my experiences with my backyard squirrels and the constant battles I have with them. It is set with a comical tone but don’t let them fool you. Squirrels may be cute and adorable but they are also evil rodents. It is in the stage of being edited. I started NaNoWriMo 2011 for the first time and completed it. The novel that came out of that was entitled “A Woman Of Color” which is a true life story based on racial experiences. It needs to be edited as well. I have an upcoming collection of stories that will be based on things I have learned from my birds. I will be having two short stories published in ebook form which will be a collection of short stories by the end of the year. I have a few short stories that I mean to work with, as well, either in a collection form or to extend into a book when time permits. How do you find the inspiration when writing your stories? When I start a story it always begins with one fact stated in a sentence. I just get excited when I am writing. Most of my stories are about things I have learned, experienced, or been around. Things that I can write about that mean something to me and hopefully when I am done means something to others. It is hard to explain. I literally get giddy when I write. Life goes by without a sound as the words come out. I’ve been fortunate that I have yet to have major writer’s block up to this point. Being active on Twitter and coming across fellow authors who are succeeding with the passion to write like I do is also encouraging. Seeing them do it makes me feel I can, as well. They inspire me. They also encourage me in ways that is so helpful. My two writing groups do the same as well. I get so charged being around fellow writers, it is a feeling that if I could bottle it up and sell, I would be doing really well. I have had members of my writing group tell me that they are motivated by my energy and constant writing. I like that. That inspires me a lot. What’s influenced you the most? My husband, for one. If he had not told my friend years ago that he felt I wrote well I would never have even thought of starting to put my thoughts on paper. That is where it started for me. The friends I have made online on Twitter has made a huge impact on me. They are doing what I am trying to do, make it in the world of writing. They are truly inspirational to me and so very much supportive. While my family is happy for me, I know they get tired of me talking about writing. My writer friends, on the other hand, is a different story. We could talk about this subject for hours and not get tired. They have motivated, helped and lifted me. I been blessed by my family and friends who don’t pish-posh my dreams to the side. What do you in your spare time? Do you spend it reading or doing research for future works? I am an avid reader since the age of a young child. I review books for Booksneeze.com and I also review for authors when they ask. I am a member of two local book clubs. One is run out of one of the local libraries while the other is run by me. One of my favorite hangouts are the used bookstores in town. They see me weekly. I have a book in my purse, car, bed stand, coffee table, and so on. The more I read the more I can draw from for my writings. I have a list of potential works that I want to pursue later on down the road so when something comes across my desk that can help me in those endeavors I take notes. As of 1998, I’ve been owned by birds. I have bred and raised them for years and at the moment we have 8. People have told me that birds can’t compare to dogs and cats. My response is simple. They have obviously never owned a bird. I also exercise 4-5 days a week, as it helps with my chronic illnesses that I have. I love music and dancing even if I can’t sing or dance well. I love how it feels and it lets out bad steam that might be building up. Movies are another passion. Like a good book, it transports you away from your life even if it is just for a few hours. That is if it is done right. My hobbies are many but I like to stay busy. When thinking about writing new material, do you take the time to outline your story or do you just go with the flow and see where it takes you? Majority of the time I just go with the flow. The only time I have done an outline of shorts was for NaNoWriMo 2011 which was the first time I attempted this writing frenzy. It was on the advice of a friend and if it was not for that I would not have won. But for the most part, I sit down and just write. A majority of the time, I already know the ending in my mind. I tend to write long hand. Sitting in front of the computer, well my juices just do not flow. I have tried and it stops me cold. Granted, typing it up after I am done is not fun. I like to see where it takes me. I generally have an idea of where the book is going. But what I like is when people give me suggestions and the book goes in a totally different field. That just makes the book so much better for me. Do you have any recommendations for books that you think the blog’s readers may enjoy? My recommendations would be for the readers to try reading outside their zone of reading. To me this means reading books for all ages. Just because a book is labeled for teens does not mean it is off limits to me and that I won’t like it. By doing so I have gotten a taste of what it is like to be that age once again – I love that. It gets me back on track if I am lacking for what ever reason. I love all books, if it has a binder chances are I will read it. While I don’t like everything I read, I try not to limit myself. I suggest to your readers they try to do the same thing. Do you have any tips, or thoughts, that you would like to offer to the blog’s readers? Sometimes, the easiest and simplest thoughts are the ones that mean the most. Love yourself even when you feel you are not worth it. Life is short. Make good use of it. I hope everyone has enjoyed this interview as much as I have and that they’ve learned more about you, Sharon. I thank you for the opportunity that you’ve given me to feature you on my blog. I look forward to the release of your book and any others that will come to fruition later on down the line. I wish you the best of success with everything. Sharon has finished her first M.S> which is entitled “Jasper, Amazon Parrot: A Rainforest Adventure”. While waiting for her editor, she has finished a novelette entitled “Squirrel Mafia” and is halfway done with the second volume to the Jasper series. 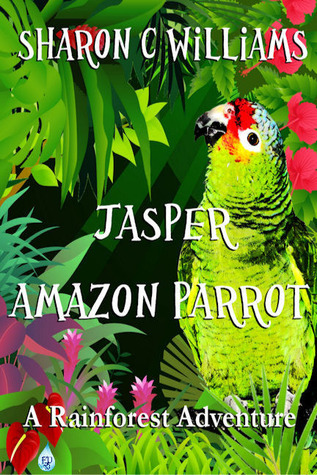 “Jasper, Amazon Parrot: A Rainforest Adventure” is a book based on her Amazon parrot, Jasper, and is set in the rainforest. Sharon has a B.S. Degree in Chemistry. When she is writing, she envisions the scenes in her head. She tries to imagine the reality of what is written down on paper. The different options, scenes, and problems will be listed down on the side in case she can use them later. Sharon tends to write by long hand as the flow works better for her. On the side, she loves to read, take pictures, walk, exercise, go to the movies, and listen to music. Sharon is a budding bird watcher and learning to crochet on the side. She runs a book club in town but is also a member of one at a local library. She is a huge sports fan which includes baseball, basketball, hockey, and football. She has raised and bred birds since 1998. Sharon made her first attempt at the writing frenzy that is NaNoWriMo this year and completed it with a novel entitled “A Woman Of Color”. It was a pleasure interviewing you, Sharon. I’m glad you like the cover. Jasper’s quite photogenic and a wonderful subject for your story. Looking forward to it when the time comes. Best of wishes always.